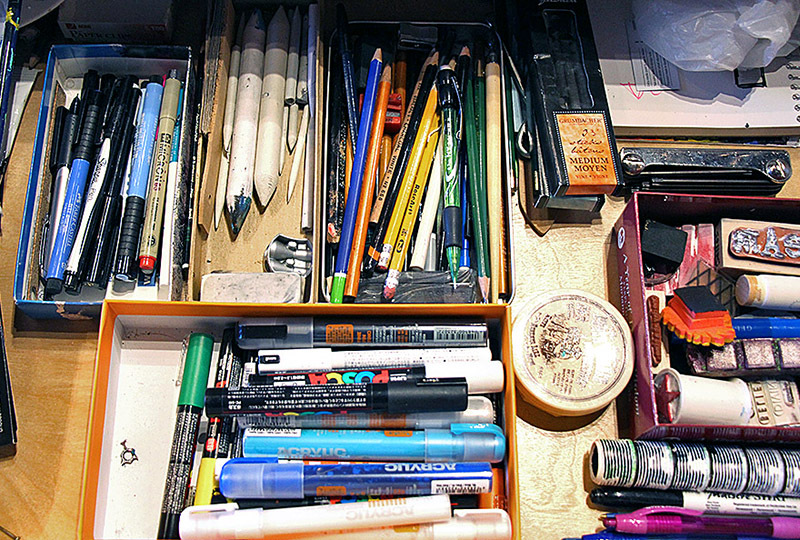 Most creatives have the typical “junk drawer” full of pens, pencils, and markers. The problem with this cram-and-jam method is when you need a specific tool. It often takes a lot of searching and frustrated digging to find that special item! 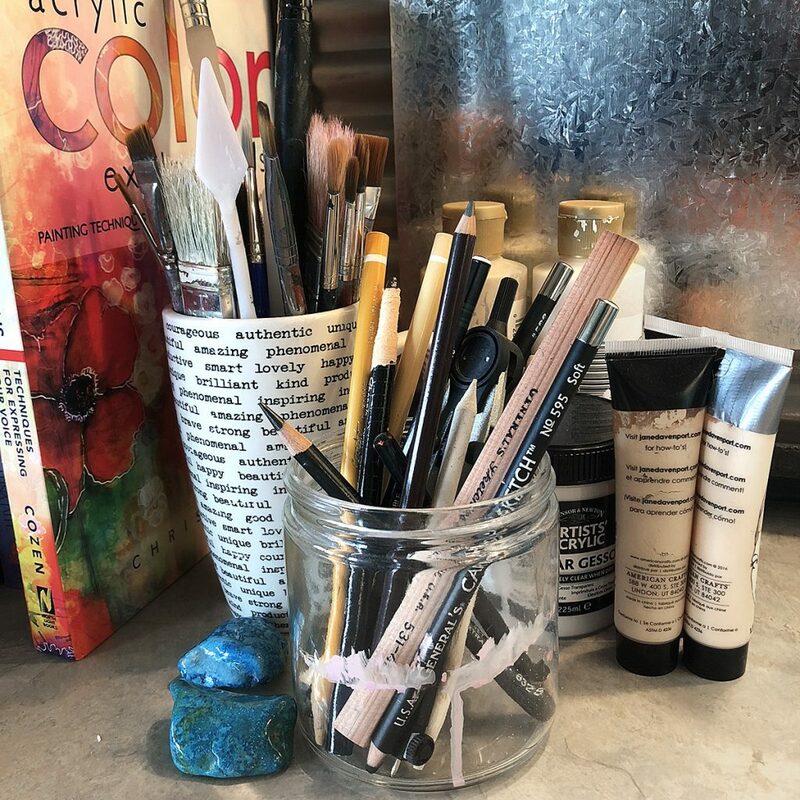 The truth is that organizing your paintbrushes, pens, pencils, and markers is easier than you think, plus it will save you a ton of time when you are creating! I’ve tried a few different ways to organize my brushes, but found a spinning caddy works best for me. 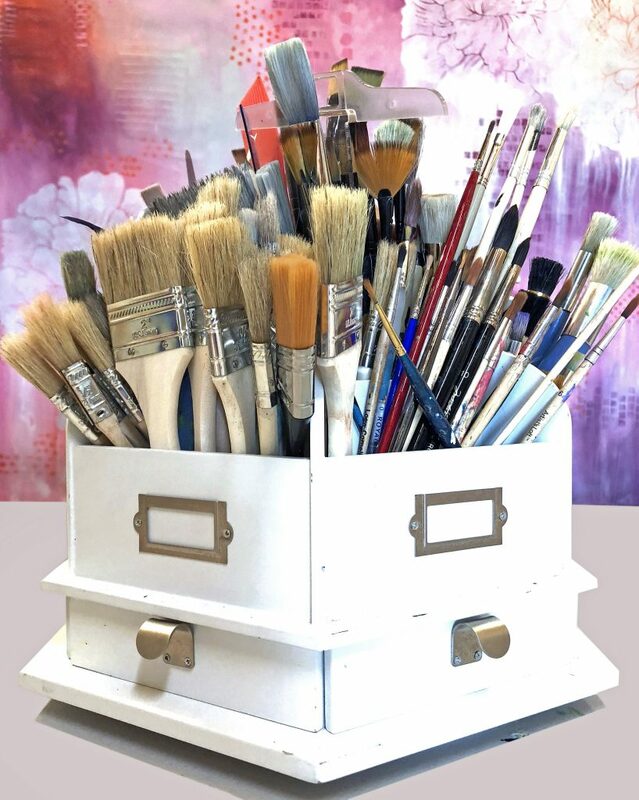 It holds all my flat brushes, round brushes, stencil brushes, palette knives, and the miscellaneous other items. In the video below, I show you how it works and why I love it. The caddy is called Recollections Storage Desktop Caddy, $30 (reg $50) at Michael’s. There is no shortage of adorable mugs available today. 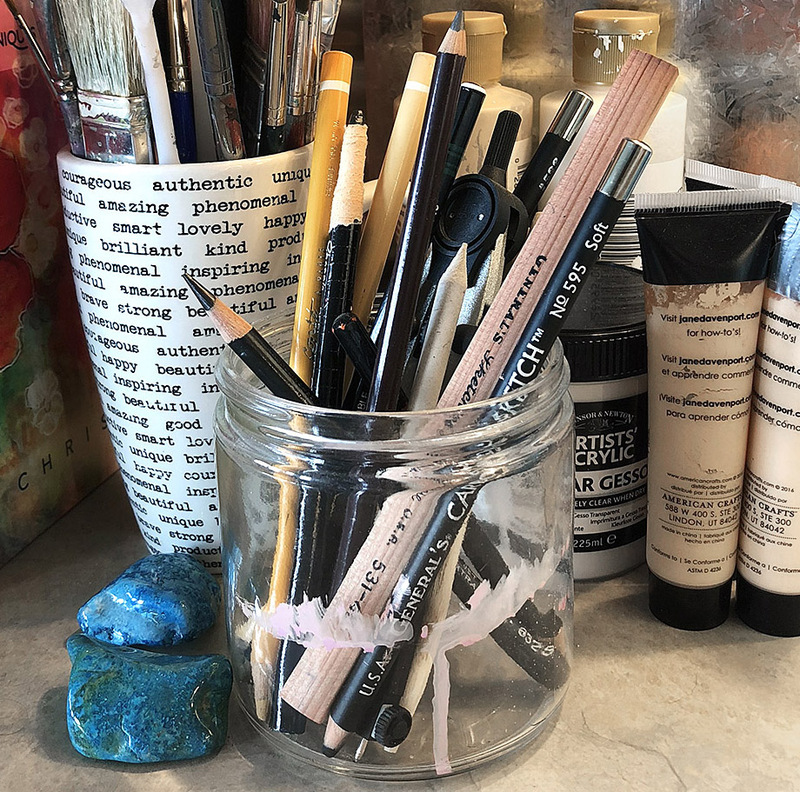 Choose any that you love and use them to store your brushes, especially the shorter ones (stencil brushes, dot makers, etc). I have a short wide one that one of my kids made when they were little (below) and another with affirming words typed all over it (2 pics below). They look amazing and are functional do. Win-win!! Good ‘ole Mason jar, we love you. Forever. Amen. Is there anything you can’t do with a Mason jar? And now you can get them from Target in clear or blue, so it’s so easy. 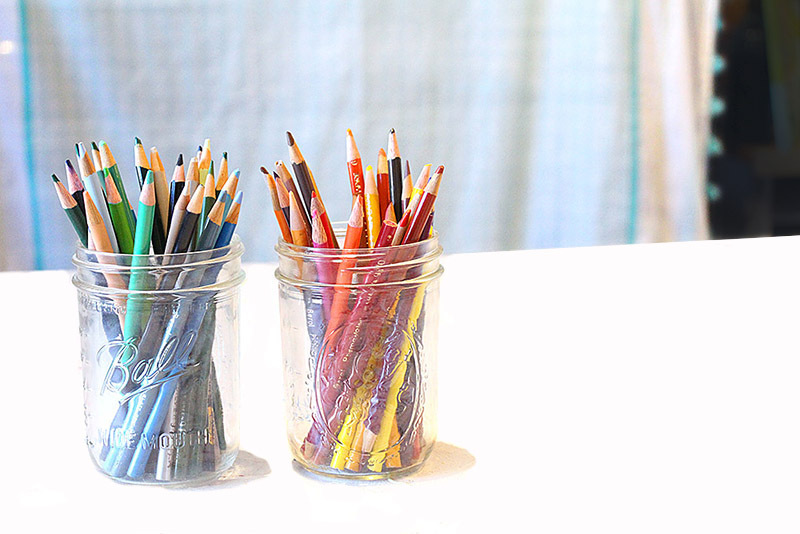 I love the shorter, wide mouth jars for my water while painting, pencils, and paintbrushes too. 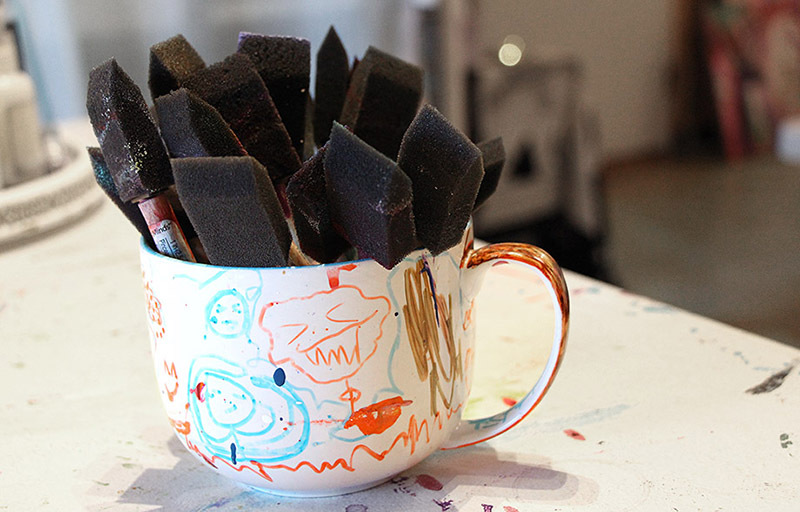 Excellent staple in the art studio! You can also recycle jars from your kitchen, like this one below. 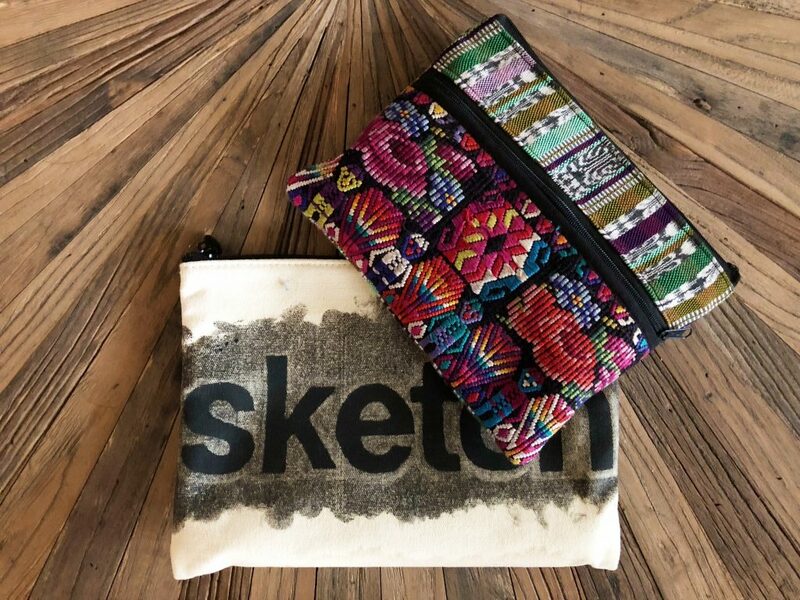 These pencil cases come in a variety of sizes and outer material. I like this smaller one because I often take it when we are on vacation so I can sketch on the go. I love the zipper so that nothing accidentally falls out. 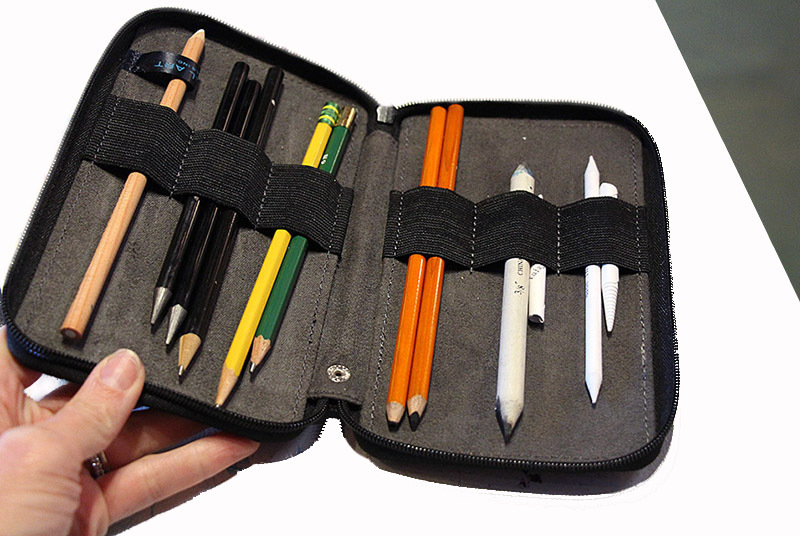 The elastic bands keep my pencils and blending sticks in there nice and tight and there’s even room to squeeze my pencil sharpener in there too! Personal share: when I was a kid, I loved making boxes. I used paper, cardboard, or whatever I could get my hands on. I’d fold the corners over, Scotch tape them all, and have a cute container. I don’t know what it was, but that was my thing! So, now, anytime I need a little box and can’t find one . . . yup, I make one. You can recycle check boxes, product boxes, makeup boxes . . . you name it. Or go through your recycle bin and grab a cereal box to make your own. Do a search online for small box template and you’ll find some you can print, cut out, and trace. Super easy! Decorate with paper or washi tape or keep it natural. The Mason jar strikes again. They’re so versatile and cute, you really can use them for anything! I love storing my colored pencils in these. I put the warm colors in one and cool colors in another. You just finished off that mint chocolate chip gelato (or maybe it was me) and head to the recycle bin . . . but, wait! That’s the perfect size to store art supplies. Wash that baby and repurpose it. Or how about a nut butter jar? Plastic or glass works. Yup. Check boxes work great for markers too because they are the perfect length. I always search for old check boxes when I need a storage container for pens or markers. Or, remember, you can make your own! 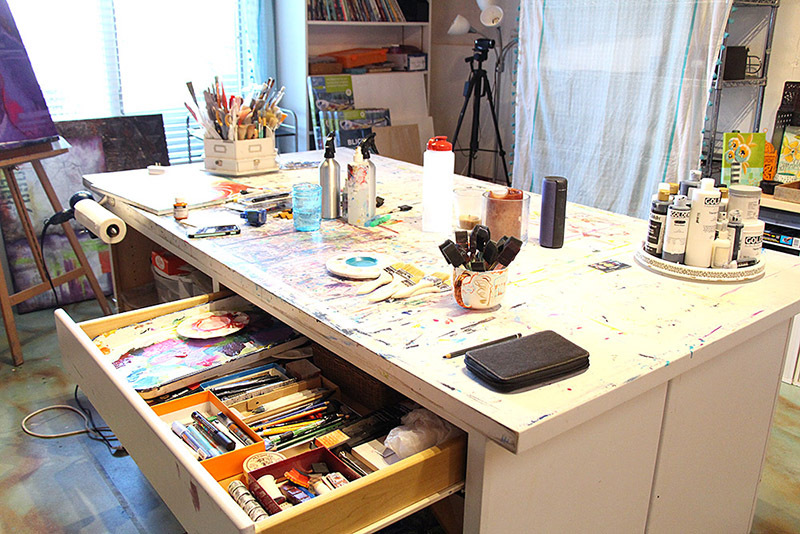 😉 I have a drawer in my worktable that looks like a puzzle of boxes, but I love it! Zipper pouches can be found at book stores, hobby stores, or any art supply store. There are so many cute patterns of fabric, word phrases, and a variety of sizes. I especially love the pouch with zipper when I’m traveling and want to take along a few supplies. See? 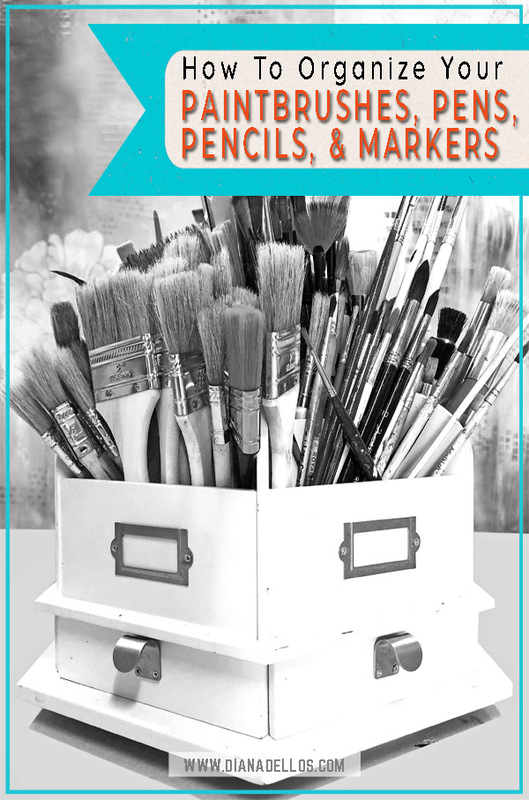 Organizing your paintbrushes, pens/pencils, and markers can be easy and even look decorative! Look around your house for various containers, display them together as a collection, and maybe add an extra jar full of feathers for something fun. Set your containers on a turn table, display them in tiers, or whatever else feels just right to you. Have fun with it!